I don't have pictures of myself actually making the beads, but there are plenty of places online where you can see that. 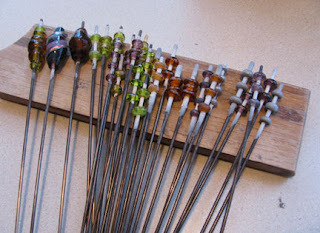 Instead, what I've got for you here is a round-up of all the basic posts and tutorials that I've written on lampworking in the past. Here are just a few of the stages that my poor beads go through. 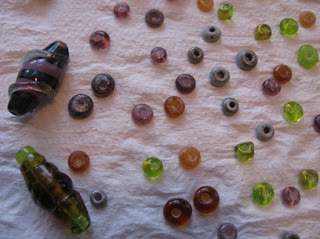 In this particular example, I needed to make a large batch of basic spacer and nugget beads. Since this can get to be very dull, I allowed myself to play around every so often and make some "fun" beads. 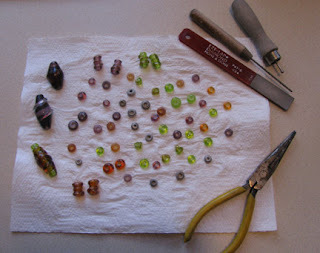 Here are some additional pictures of my favorite styles of beads to make, which I shared with you yesterday. After the pictures is the informational round-up. Do you want to try lampwork? Oh how fun Cyndi! First off, your beads are beautiful! I've never made beads or even seen them being made, so I'm fascinated. The "Beads on Sticks" remind me of rock candy that was a special treat when I was a kid. Your beads a beautiful dear! Thank you so much for sharing! I've been wanting to take a class in lampworking beads. They are so expensive to buy but can really make a piece. 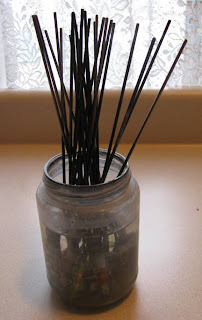 I had the rock candy on a stick thought too. Lol. Ah ha... your secret candy obsession has been revealed Cyndi! LOL Well they are absolutely beautiful! I really appreciate you sharing with all of us in Blogland!